So… I am actually a week late on this post. Woops. That’s okay though, and I hope you forgive me. Haha. The past few weeks have been super busy and stressful, but the waters have stilled. Hope you are doing well and staying positive! Let’s order some take out, pull up a chair and welcome to my life as a Durhamite. I made bread in the past 2 weeks. It was nice! I think it is amazing that we are able to create something with our hands that is good for us. 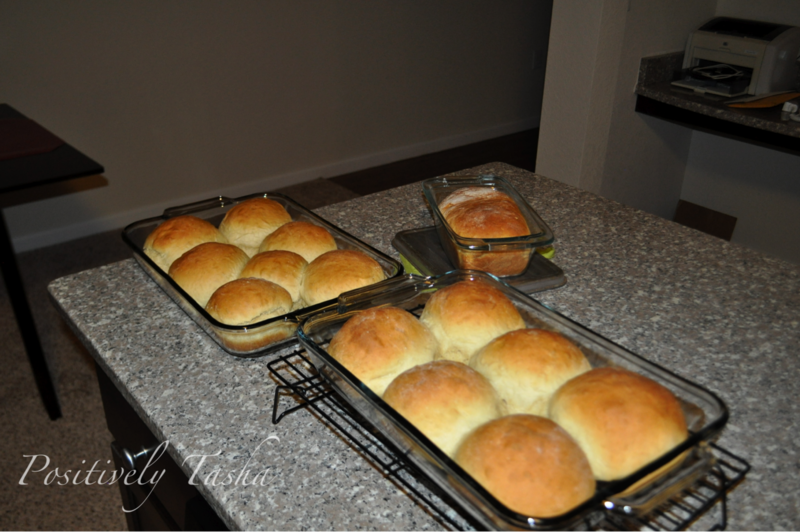 My brother, Stephen, had asked me if I was starting a church because I was baking so much bread. Haha. Silly Stephen.I did give some to some of my co-workers at work, though. It’s so fun to share! 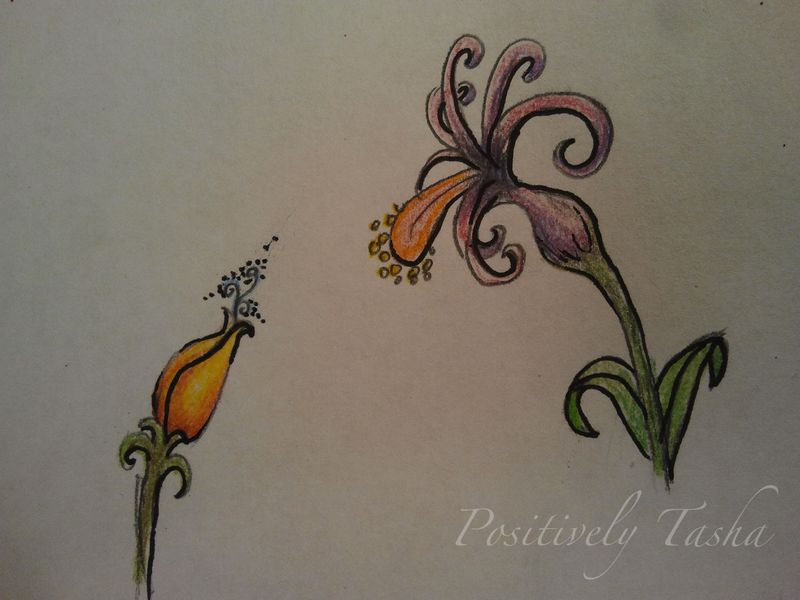 There was some time where I was waiting for something to happen at work and found some free time in between preparing, to sketch a few flowers. The colored pencils were right there staring me in the face, and I had to listen to their pleas! I have been thinking of different designs I can try in my digital drawing and I think I will make this design a digital art piece using Illustrator. Stay tuned to find out how that turns out. I went to my first Meet-Up on Thursday May, 22nd. It was called “Thirsty Thursday Game Night” and was at a bar named Rum Runners in Raleigh. 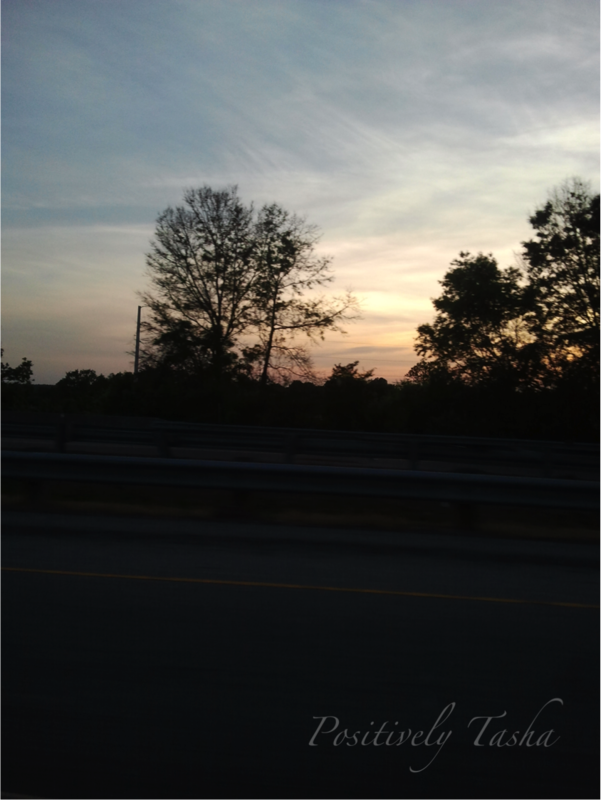 The sky was very beautiful as I was heading to Raleigh. See it? This was my first time being in Raleigh at a bar by myself! IIt was very interesting and I did have fun, though. If you were single, they gave you mardi gras beads so you could identify other singles. That was an interesting idea. Hehe. The Thirsty Thursdays even takes place every week and I felt as though many of the attendees had known each other at least for a while. It was like a bunch of friends got together to play games. Which was awesome … but also kinda awkward. I do want to go again, maybe I will bring a friend and I wouldn’t feel so “odd woman out”. We had “Giant Jenga” and it was the game made by cut 2×4 wood planks. It was terrifying to play, especially when it was very unstable. I was adement that I would not be the one to knock it over, and my heart was racing. Luckily, the guy standing next to the tower was the person who brought it crashing down after a few rounds. 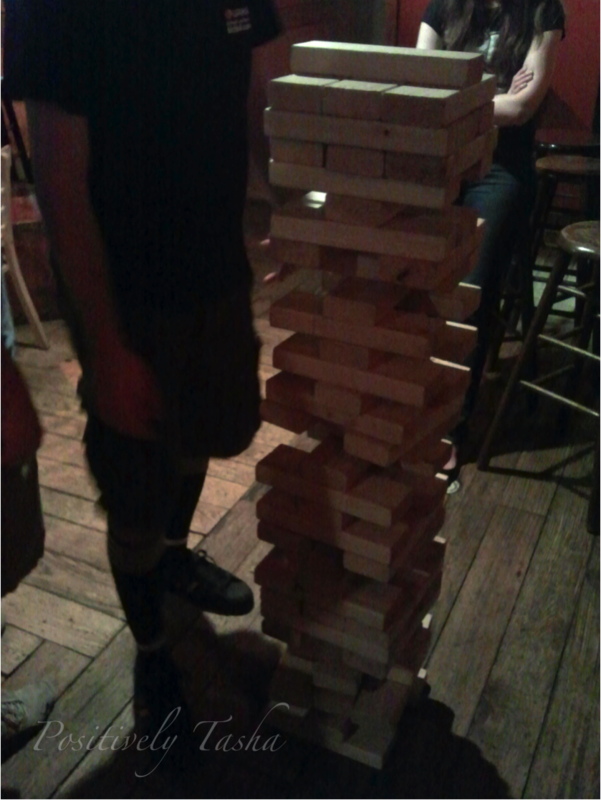 It sounded like a gun shot going off and the whole bar screamed, “JENGA!!! !” I could only play that once. My heart would never forgive me. Hahah. 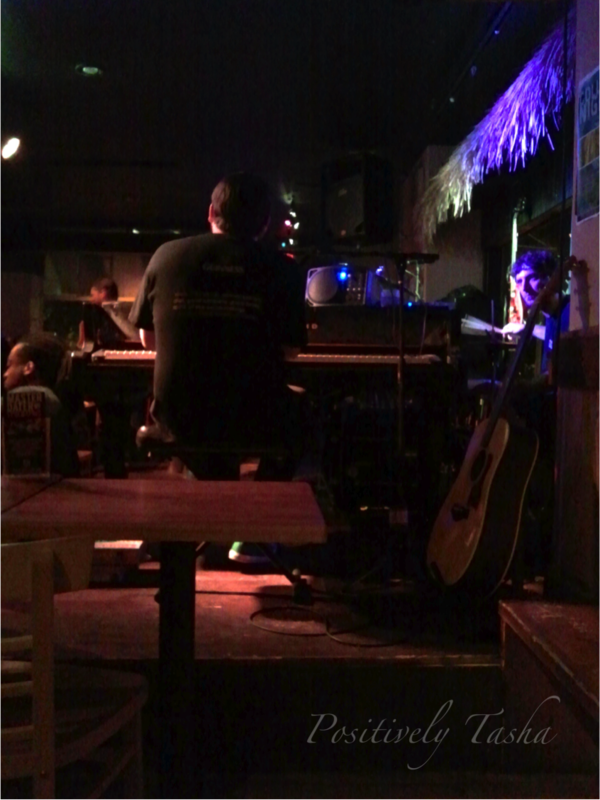 After the game night had ended some people who worked at Rum Runners, who were also musicians, took to the stage and played any song that was requested. It was pretty cool that they were able to play and sing off the top of their heads like that. I decided that my balcony can also be a place where I can hang out. It was super nice! I put down my beach towel and then the floor pad my mother made me and some pillows. I turned on the laptop, pulled up Hulu/Netflix and started watching TV! 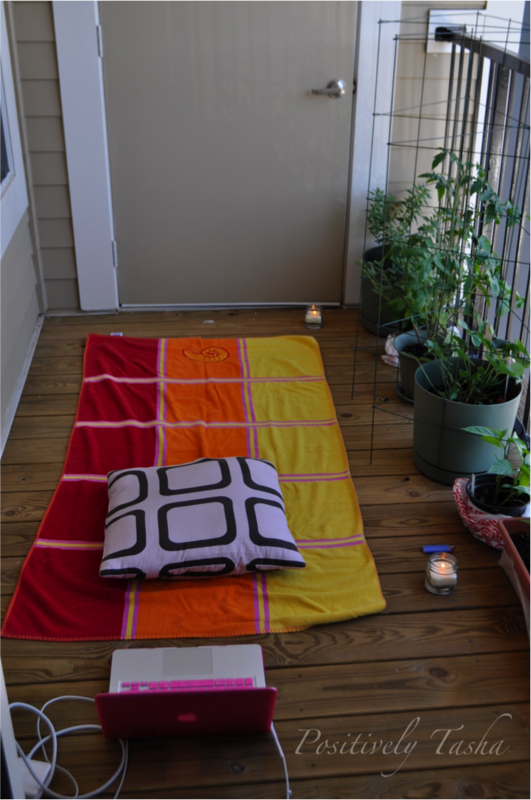 Those 2 candles are my citronella candles, I have already burned those out so I will need to purchase some more. Yay! Look at how happy I look. Haha. I thought you would probably want a picture of me out there on the balcony so there it is! I do believe that I could fall asleep out there, especially when the weather is super nice. See my garden? Hey garden! On Saturday, May 24th my sis, Jean, and I went to a Thai restaurant for our Saturday meal. We were the only customers in the restaurant. I think it was due to this weekend also being Memorial Day weekend. People are out grilling with their friends and family! She ordered the roasted duck soup and I had green curry with tofu and Jasmine rice and a Thai iced tea! My curry was super spicy but it was good. After lunch, we were given these mints. 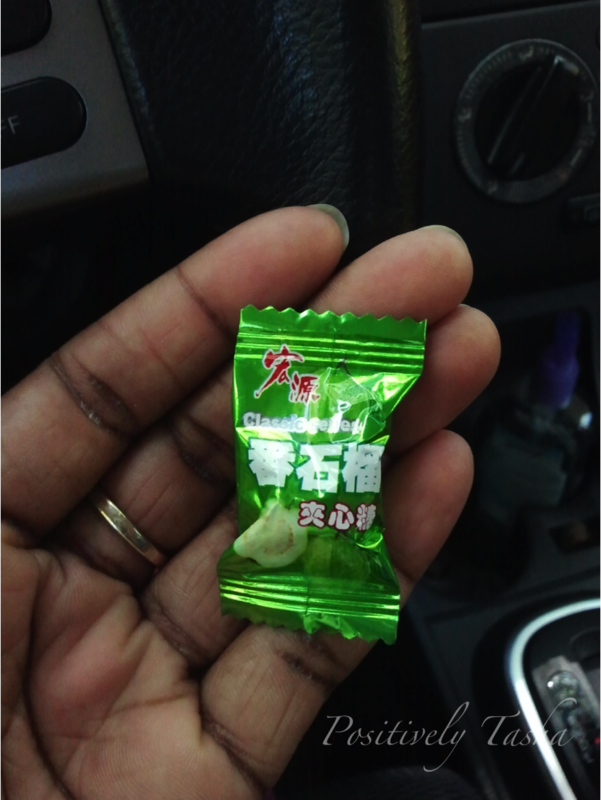 I can’t read that language but it turns out they weren’t mints but like sour candies. It was a surprise … and interesting surprise. On Memorial Day, Jean and I finally made it to Eno River Park and had a picnic. It was so phenomenal that we plan to do it again! (Right after the mosquito bite itchiness wears off). We hiked into the park and found a nice place by some trees in front of the river to eat. I didn’t realize it until now, but together we were wearing red white and blue. Haha. Jean is leaving for Cali soon so she is documenting all things Durham! 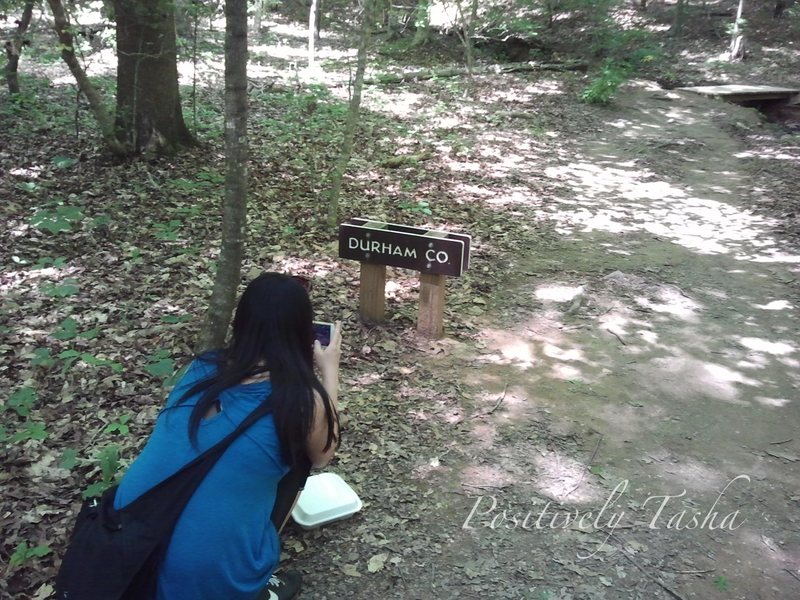 As we were walkingthrough the park we noticed we had left Durham County and entered Orange County. We saw this sign informing us of this. I don’t have any immediate recollection of entering into a different county by foot so this was first! 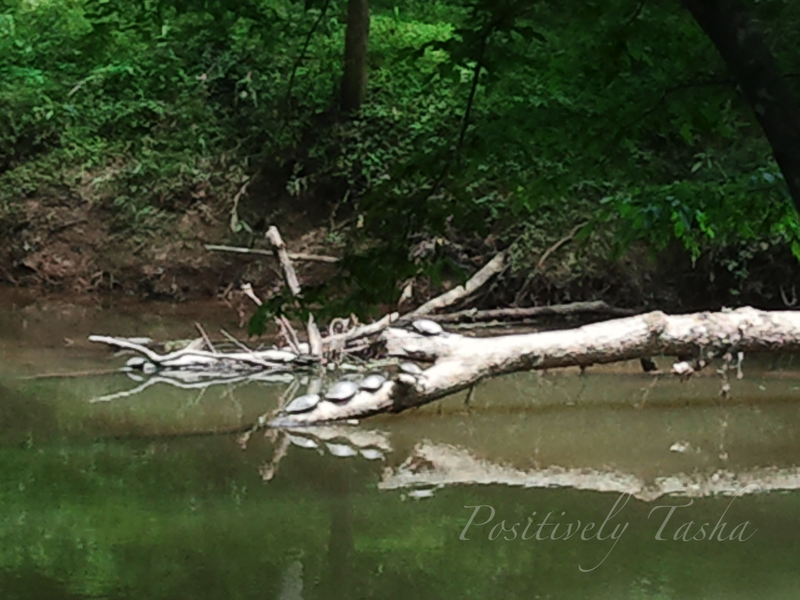 As we were walking back to our cars, we saw a family of turtles resting on a log. (I took this with my phone so please mind the blurriness of the photo). It was amazing! While we ate 2 turtles were swimming around in the water so it was beautiful seeing a group of turtles relaxing together. 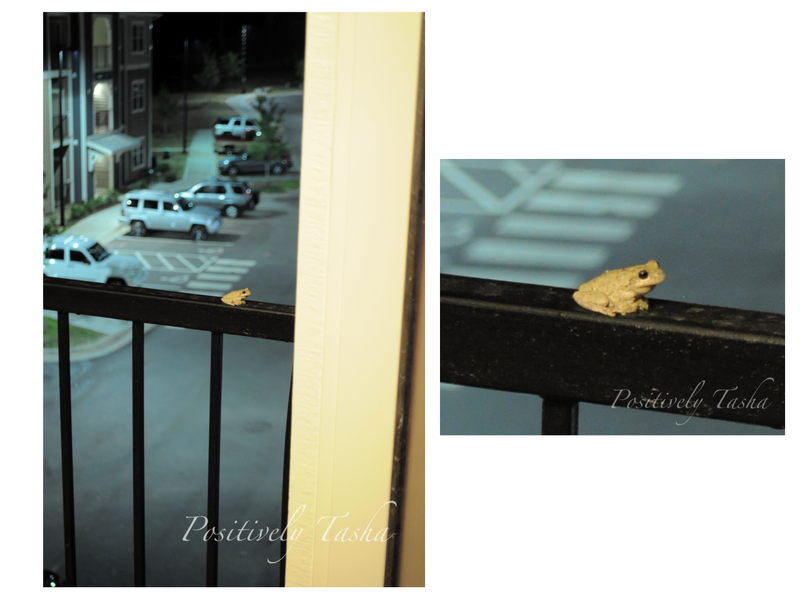 One evening this past week, I went outside to check on my balcony plants and noticed this frog sitting on the rails! I’m on the 3rd floor! What is he doing up here? Haha. When I stepped outside, i turned its head to me and was looking at me! He was just sitting on the railings the whole night, so I thought I would snap this picture (no flash was used) to capture the memory of his presence. I also saw him again a few nights later, and saw him sleeping in one of my plant pots on Sunday afternoon. He was on the railing again last night. I think he is probably a nocturnal frog. I put some water near the plant where he was sleeping. Hope I didn’t scare him away! Sadly, during the course of these 2 weeks my laptop charger died on me. The frayed cords completely separated themselves from the base of this mag safe box. The charger had been going out for a while now. It would reach incredible heat temperatures to the point of burning me on the fingers! I had to put it in the freezer many times to get it to cool down. 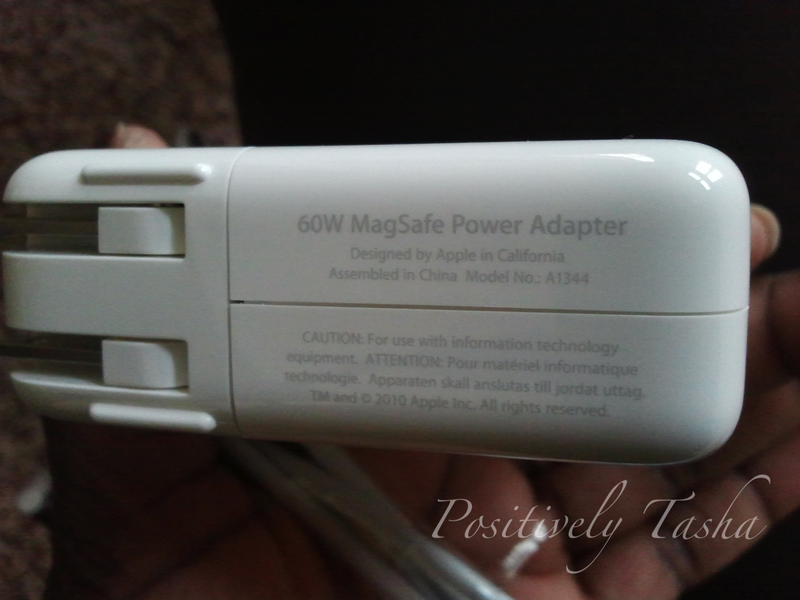 I bought this 80-dollar replacement charger, which has nearly 2,000 reviews and 1 1/2 stars on the Apple Store website. I had no choice but to go to the store and purchase it. Sure, I could have bought it online, but I needed my laptop and couldn’t wait 7-10 business days for the charger to arrive in the mail. Besides, if anything is wrong with it, I have the 1-year Apple warranty. On Friday I purchased my first ever take-out meal and ate it in my apartment! 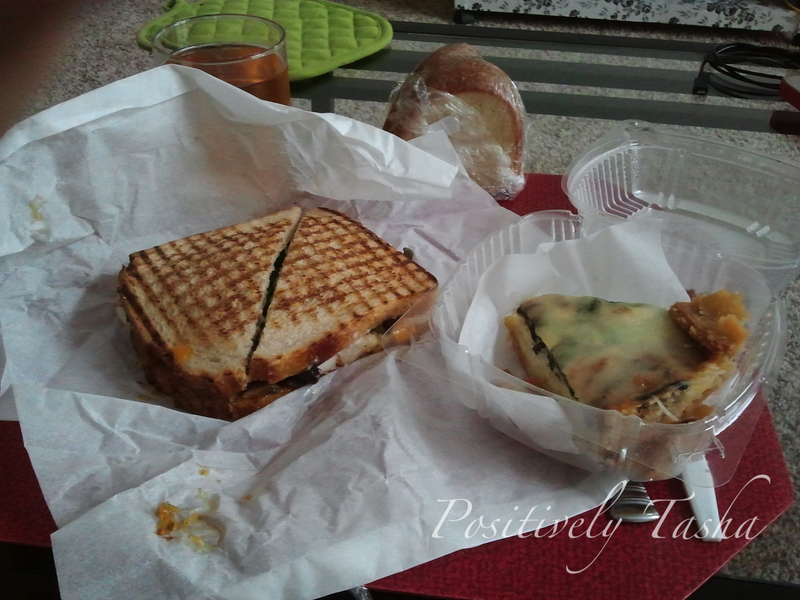 I went to Parker and Otis after work and purchased some food and dessert to eat as my dinner. I hardly ever do this because it costs so much money to constantly eat out. I’m not sure how people do it… their pockets much be 5x as deep as mine. 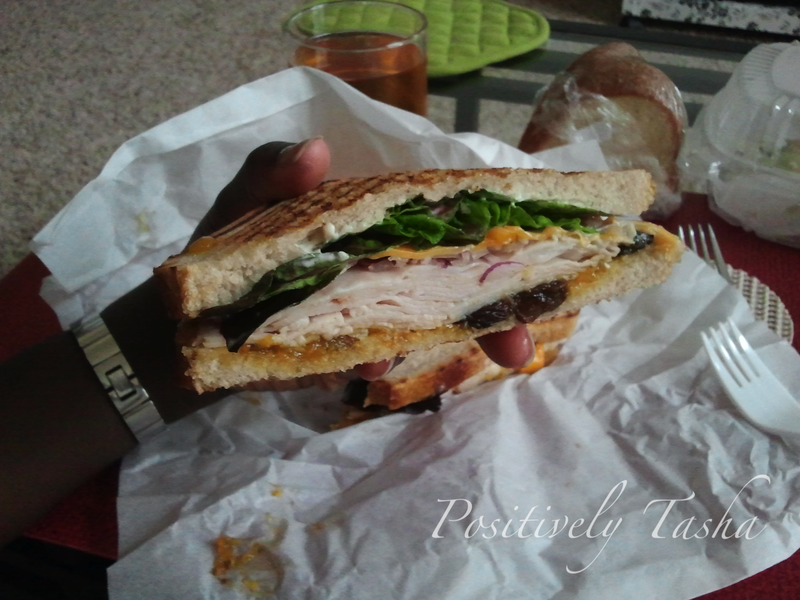 I bought the spinach and mushroom quiche with the turkey and mango chutney sandwich. It was really good! I don’t each meat very often, typically when I do it is a seafood item, but I felt that I really needed the protein. Eating a salad with chunks of tofu wasn’t going to do it for me that night. I also purchased some sour cream pound cake. Which sounds incredibly weird, but it was good! Look at the layers on that sandwich! Being Guyanese, I love mango and the chutney was spot-on. I wonder if they sell it in the store… I need to check! I want to BUY some! Anywho, doesn’t it look yummy? It totally was. 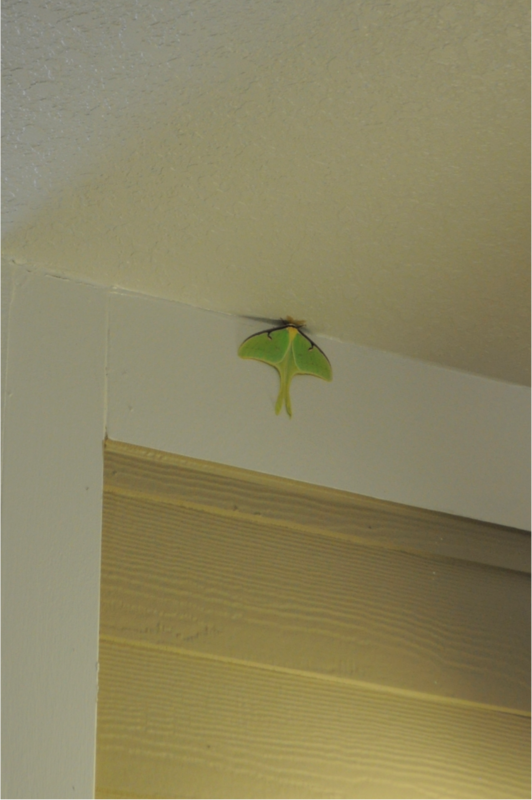 I could only eat half, at the time, but I ate the rest later… oh yea..
My blog post today ends with this photo of a mega huge green moth which was above my door all day and night on Sunday. It somewhat scared me walking in and out because I did not want it entering the apartment. However, it was a beautiful creature … from afar. I snapped this photo Sunday evening. On the other side of the moth was a large black spider. I also noticed on our floor a few other moths in the stairwell area. I guess it is warmer up here than the other floors. Well that was actually kind of eventful! Things have been stressful and hectic but I still managed to do somethings over the last few weeks and take pictures! Hope you enjoyed the journey with me! This weekend I will be attending one of those meetups with Jean. We are going to sketch in Trinity Park on Saturday! Hopefully more fun things will happen and I will be sure to document them to share with you. Thanks or sticking with me, friends!